Understanding the stages of pregnancy can be difficult because the dating methods used by doctors don't exactly line up with the yearly calendar. Furthermore, pregnancy is divided into trimesters or three periods of time. A working knowledge of the key terms used in pregnancy dating is helpful in the treatment of miscarriages and other pregnancy losses. A due date, for example, is the estimated date of delivery (EDD, or sometimes EDC) or the date when a pregnancy reaches exactly 40 weeks from the last menstrual period. Gestational age is the medical term for how many weeks and days of a pregnancy have passed. It has a major impact on a fetus’s likelihood to survive a preterm birth. Last menstrual period, often abbreviated as LMP, this is the first day of the last time you had your period before becoming pregnant. It is used to calculate your due date before any ultrasound testing is done. Preterm is a full term pregnancy that is 37 to 42 weeks. Any labor or birth prior to 37 weeks is considered preterm. A trimester is approximately one-third or three months of a pregnancy. Trimesters are referred to as first, second and third. Not every trimester is the same length. When you first become pregnant, you will be asked when your last period was. Even though it seems strange to calculate a due date based on a time when you were not pregnant, it is the easiest way to estimate how long you have been pregnant until an ultrasound can be done. Once you have an ultrasound, your due date may be changed based on the measurements the tech is able to take of some of the fetal body parts. The date should only be changed if the ultrasound is more than five days different from your LMP unless you are uncertain of your period. Your doctor will be able to explain why your due date has changed, should this happen. The further along in pregnancy you are, the less accurate an ultrasound is at estimating your baby’s age. So if you did not know you were pregnant until later or have very irregular periods, your due date will be slightly less reliable. Your doctor will inform you if an inaccurate date will affect your care or the care for your baby after delivery. 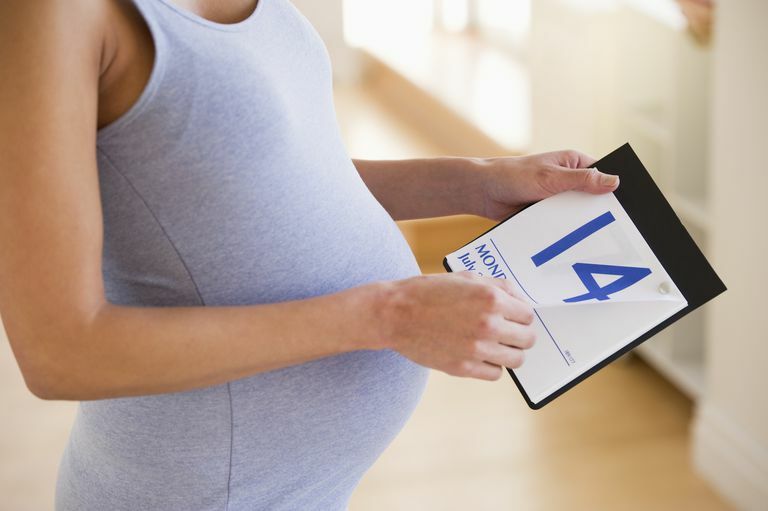 It can be hard to understand how the “months” of pregnancy fit with the calendar. Since pregnancy is best described in weeks, it does not exactly correlate with months of the year. A pregnancy lasts 40 weeks, or 10 lunar months (which are four weeks long), but because the months of the year are longer than 28 days, a pregnancy is closer to nine calendar months, though it is not exact. To help your doctors and nurses take the best possible care of you, it’s best to know how many weeks pregnant you are, rather than months. It may be helpful for you to write the number of weeks you are on your calendar. This is simple to accomplish by writing 40 on your due date and counting backward on the same day of the week. For example, if your due date was May 30, you would be 39 weeks pregnant on May 23, 38 weeks on May 16, and so on. Your gestational age, or how far along you are, can help determine how your doctor is able to take care of you if you begin to have signs of miscarriage. Early in pregnancy, there is little to be done to prevent a miscarriage. However, later in pregnancy, cramping or contractions may be treatable with medications to prevent preterm delivery. If you do go on to have a miscarriage, it is important to know how far along you were, particularly if you were near 20 weeks gestational age. Your state law may vary, but most states recognize 20 weeks as the point at which a funeral home must be involved in a burial or cremation. Local law may also affect whether you are able to have a therapeutic termination if indicated. The number of weeks pregnant you are at the time of a loss can also affect your future treatment. Early miscarriages are less likely to happen again in later pregnancies, but women who have a later miscarriage or stillbirth may be at risk for a recurrence. Knowing your dating can help your doctor or midwife determine what, if any, testing you need to assess your risk of having another loss. Each trimester of a pregnancy has its own features. The odds and characteristics of pregnancy loss are different for each trimester. The first trimester is the first 12 weeks of pregnancy. Often, women do not even know they are pregnant until six weeks or later, meaning this trimester can seem shorter than the others for many women. During these weeks, women tend to experience more of the “classic” discomforts of early pregnancy, like morning sickness, breast tenderness, constipation, fatigue, frequent urination and possibly abnormal vaginal bleeding. It is, unfortunately, also the trimester with the highest rate of miscarriage. About 80 percent of miscarriages occur before the 12th week of pregnancy. The most common sign of miscarriage is vaginal bleeding. Other signs include cramping and the loss of pregnancy symptoms. There is usually nothing that can be done to prevent a miscarriage in the first trimester. You should consult your doctor or midwife if you have concerns about your symptoms in the first trimester. The most common causes of miscarriage in the first trimester are chromosomal abnormalities, though other causes exist. If you have one miscarriage, especially in the first trimester, the likelihood of having another one is small. If you have had multiple miscarriages, you may be a good candidate for further testing. Talk with your doctor or midwife about your personal situation and what you can do to improve your chances of having a healthy pregnancy. The second trimester spans weeks 13-28 of pregnancy. Generally, women feel “better” during this trimester, with relief of their morning sickness and other early pregnancy discomforts. Most women will first feel their baby move during the second trimester. This is also the trimester when a fetus becomes viable or able to live outside the womb. Viability is currently set at 24 weeks. Three different types of pregnancy loss can occur in the second trimester. The first is a late miscarriage, which happens between 12 and 20 weeks. After 20 weeks, a pregnancy loss is considered a stillbirth or intrauterine fetal demise. The second trimester is also when preterm labor becomes a greater concern. After 24 weeks, there are treatments available for preterm labor, though the treatments are not always able to prevent premature birth. Prematurity is one of the leading causes of death in newborns. The final type of loss, which is often overlooked, is therapeutic termination. When a fetus has a severe anomaly that is known to be fatal or when a mother develops life-threatening complications during her pregnancy, the safest option may be to end the pregnancy through surgery or an induction of labor. Therapeutic terminations are most common in the second trimester, though there is a slight possibility of a woman developing a life-threatening condition during the first trimester as well. As in the first trimester, the leading cause of second-trimester pregnancy loss is chromosomal abnormalities. However, late miscarriage is more likely to be due to other causes. Some common causes include infection, maternal clotting disorders, and placental abnormalities. The third trimester, or weeks 28-42 of pregnancy, is the most flexible in length. Since a pregnancy is considered full term at 37 weeks, there are actually five weeks during which delivery can be considered normal. Prior to 37 weeks, any birth is still considered preterm, though the outcomes for babies born early improve with each week closer to 37. During this trimester, women are visibly pregnant and begin to experience more of the aches and pains of pregnancy. Usually, morning sickness has resolved by this time, but there are other discomforts related to the growing baby, such as heartburn and an increased need to urinate. Preterm labor is a major concern during the third trimester since prematurity is so dangerous to babies. However, there is also a continued risk of stillbirth in this trimester. Other pregnancy complications, such as preeclampsia, which are known to contribute to preterm birth and stillbirth, tend to occur more frequently during the third trimester as well. Another type of loss that women in the third trimester may face is a neonatal or infant death. Whether a child is born with known medical complications or is born premature, they can be at risk for death soon after birth. Although not everyone recognizes this as a pregnancy loss, these deaths may be counted statistically as part of perinatal mortality. At this site, neonatal and infant death is considered part of the pregnancy loss spectrum. Varney, H., Kriebs, J., et al. Varney's Midwifery, Fourth Edition. 2003. Cunningham, F., Gant, N., et al. Williams Obstetrics, 21st Edition. 2001.